Each week I’ll try and post quick links to things that I’ve seen, read or just sparked my interest in the previous week, with a little background and my thoughts and other things that I’ve been up to in the previous week. Mostly gardening, cooking and environmental stuff but not always. I’m a fan of chickens and dream of having some of my own one day, so I was interested to read what Bill Gates (of Microsoft fame) is up to. You can read about it here, and (if you follow the instructions), he’ll donate a flock of chickens to someone that needs them. This Grist article got me thinking about neighborliness, as well as local distinctiveness. I think I’ve been lucky with having mostly good neighbours where I’ve lived. Some better than others, but compared to stories I’ve been told or read, all generally far better than some. Of course it’s a two-way street, and being neighbourly means just that. You have to be neighbourly. Local distinctiveness is something else, but in a way related to some of the sentiment in the article. I think the “progress” that I see means that a lot of things that make an area distinct from somewhere else are fast disappearing and we are ending up with cloned areas, where if you were dropped into them blindfolded it would be difficult to tell one from another. I’ve been doing a lot of travelling on buses this week, and therefore had a lot of time to look out of the window and watch the world go by. I’ve seen things that have stood out as being different, but in most cases these are all in areas that have been around for a long time, and not those that are newly built. I feel like perhaps these should be captured for posterity or at least memory. The local newspaper often has a section in it which looks back on old photographs and events that happened in the area many years ago. I wonder if in another 50 years there will be the same amount of material as the tendency is for these to be captured digitally and although (at least in theory these are easier to preserve), are they also more likely to be lost? Accidentally deleted, or destroyed when a hard drive fails? I don’t know, but a physical thing, a “printed” photograph say, feels more permanent somehow. 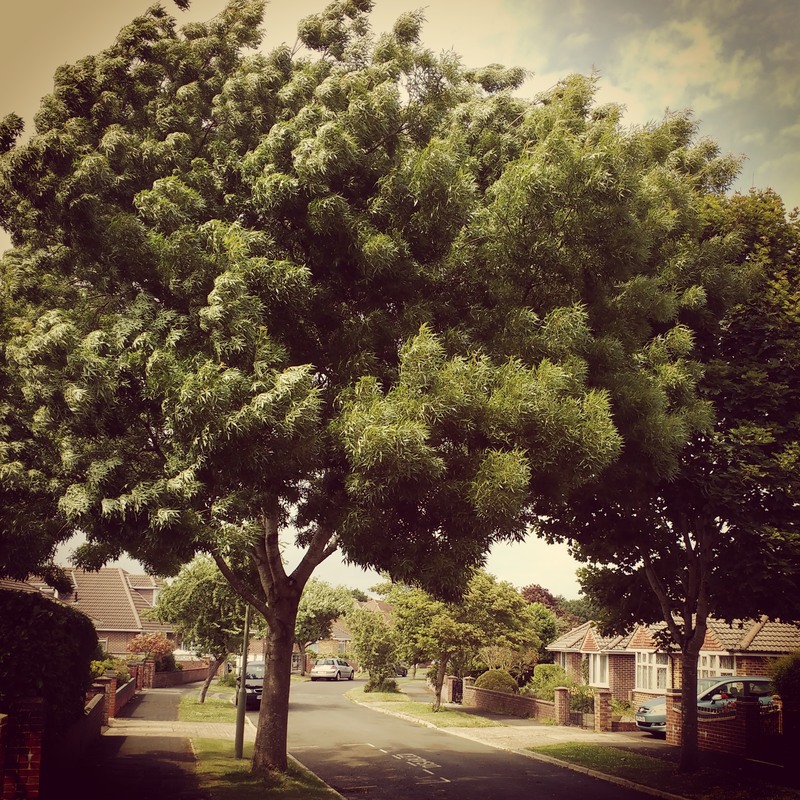 I’ve also really been enjoying walking about the local area this last week, the street trees have reached their peak, and people’s gardens are starting to display their summer finery. Hi, Alan! I tried visiting Bill’s blog, but unsurprisingly (at least to me) the page would not load on my web browser. I guess he doesn’t want Linux users reading his blog. ;o) Anyway, I hope that you get your chickens soon. If we lived closer to one another, I’d give you a few good layers out of our flock for you to raise and enjoy. In regards to the subject of local distinctiveness, this has been going on in many Canadian communities and cities for a long time. When we bought our first house, in Saskatoon, Saskatchewan, the neighbourhood was a very unique one. Most of the homes in our area were war-time houses, built in the 40s. They were, for the most part, smaller in size with larger front and back yards. And the streets were lined with beautiful elm trees. But, as the years went on, the small houses were being demolished and replaced with monster duplex houses. Trees were being cut down because the houses are so big, with large garages, they leave little space for a yard or trees. The once quaint little neighbourhood has slowly turned into mass housing neighbourhoods. In other parts of the city, some neighbourhoods were completely demolished and replaced with enormous condominium complexes. It was really sad to see. And this sort of thing seems to be happening to most major cities and communities, here in Canada. This is one of the many reasons why we decided to get out of the city. Thanks for sharing these links with us! Have a great week! Thanks David – the chickens are probably a medium term thing at the moment, but you never know, I often think these things have a way of coming to the fore when you least expect it.